For all our tech and cash and sickness, our basic program as people remains worryingly primitive. Good and Bad, Right and Rong are created and celebrated by partisans of all sides in an eternal Lucha Libre League.Youth trends go the same way. Pioneering Sociologist Stanley Cohen looked back objectively at the Mods and Rockers in academic detail in his magical book Folk Devils and Moral Panics, demonstrating that they were neither as new nor as dangerous or unique as people thought. Mods and Rockers become Punks and RavErs, rinse, repeat...A now dead, long retired Prime Minister is both a Folk Devil and a Moral Panic to a diseased degree, with people whose parents had not hit puberty during her reign offering the no doubt well informed opinion that she was "a legend" or else the root of all suffering and evil in this hall of broken mirrors.A politician who has been out of office more than twice as long as she was in it being given that power to inspire and provoke buckets of bilious ire decades after the fact is a pathetic religious phenomenon. Let's set a saner context with a quote from one of the most hated and controversial politicians in British history:"Britain has lived for too long on borrowed time, borrowed money, borrowed ideas...The cosy world we were told would go on for ever, where full employment would be guaran�teed by a stroke of the Chancellor's pen, cutting taxes, deficit spending, that cosy world is gone. "That's from Labour Prime Minister Jim Callaghan in 1976.Britain's economy and politics had gone septic, and he smelt it. By Margaret Thatcher's ascendency in 1979, the whole place had Gangrene.Picture a world where striking hospital cleaners blocked ambulances from casualty, where lorry drivers set siege to Hull, deciding how much food and medicine was "essential". Want a phone? You'd have to wait weeks for the Post Office to sort it, and it rarely worked the first time. The Government owned all kinds of irrelevant things from price gouging travel agents to toilet paper distributors and you could only get olive oil in a chemists. Blighty was a badly clogged bog, far beyond the power of a plunger to sort. The voters jammed down a fucktonne of depth charges instead.The UK had run out of road and its promises became obscene jokes. DESTROY was the rational response, indeed insanity became the only creed worth a damn - but the toll of casualties, intended and accidental, is legion then and now. As Joyce said "history is a nightmare from which I am trying to awake. "It sure was not all bad for what really matters, the music. In a post-apocalyptic confusion hit with a thermonuclear handbag, new forces and faces emerged. Creation Records was founded with the help of a government scheme to part fund unemployed people setting up a business. Easy money and cheap credit made it easier than ever for promoters to print posters and buy kit. 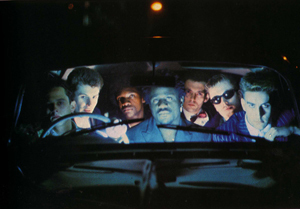 An electric e powered phoenix was being gestated from the start, but things sure seemed worse at the beginning.The majestic menace of The Specials' Ghost Town will outlast us all. Unlike much of the Two Tone Whiteboi Watered Down Ska and Reggae Parody that got an easy ride, this was something colder, older and more beautiful in its quiet rage against an emptied world devoid of love and hope. The underrated Gang of Four were honest revolutionaries, openly thwarted by reality and the lack of viable alternatives to the Number Ten Terror. Of course for all their brave bluster, one of their prinicpals ended up making his fortune in "customer magazines" for car dealers and supermarkets. So much for the revolution. With all certainties gone, strange sounds abounded. In 1984 I, Bloodbrother Be by the Shockheaded Peters a pansexual pean to pederasty and the injection of crazy cactus juice was an NME Single of the Week. Try that in our far less free, more PC era of instant Twitter lawsuits.Of course there was plenty of obvious protest music, most of it sounding as absurd and cynical now as the warblings of a lost tribe of Right On Wombles. Heavily political art risks becoming mere propaganda, just an advert for itself - as David Lynch cautioned "If you want to send a message, send a telegram." Yet amongst all the folkie fakers and rich kid commune congo circlers, timeless tunes and a new dawn broke in the abandoned spaces left by long dead industries.By the mid 80s, the last zombies of the textile industry had shuffled away in the Northern cities, leaving a load of empty spaces cheap or free for funky recycling. Does that not sound more than a little bit like Detroit, say, or even Chicago?Less openly, the Old Bill had noticed that this funny little illegal pill seemed to coincide with a big, big reduction in football thuggery and street scraps when it was sort of semi-tolerated. By 1988 tribes of the groovy had enough of fist pumping political posing, and turned to every available space to gather and tune in, turn on and bliss out to a completely new, free thinking and moving wave of electronically powered personal empowerment.Inevitably, money, media and the old tendency to find menace in anything fun or new, especially involving the young, non-white and poor closed the door to the Acid House. The Folk Devils and Moral Panics had returned to reign in the revolution. Again.But no matter who is in power in our primitive cashscape, the right time, right place, right people and best beats combo is the healthiest way to resist, survive and thrive. Whatever the horror around.And you'd better not mess around this Saturday, or you'll be horrified to miss a truly legendary new in.Huge load of classic Rock, Soul, Funk and Reggae...Dells, Cameo, Lou Reed, Soft Boys, King Sunny Ade, Culture, Burning Spear, Xray Spex, Television, Dylan, Cameo, Marvin Gaye, lots of African LPs, Stones, Neil Young, Tapper Zukie, Donald Byrd, Pioneers, MFSB, XTC, Who, Talking Heads, Edgar Broughton, Millie, Troggs, Esther Philips, Gregory Isaacs, Roy Ayers, Herbie Hancock, Orange Juice, VU, JAMC, Bowie, Robyn Hitchcock, Steel Pulse, Willie Nelson, Linda Clifford, Impressions, Pretty Things...Feel it in the racks tomorrow, and check in for a Facebook picture preview today.